I had met up with yet another prospect last week who was not aware of difference between reporting and analytical solutions. I would blame reporting tool vendor for this who has started confusing customers by positioning reporting tools as analytical solution. 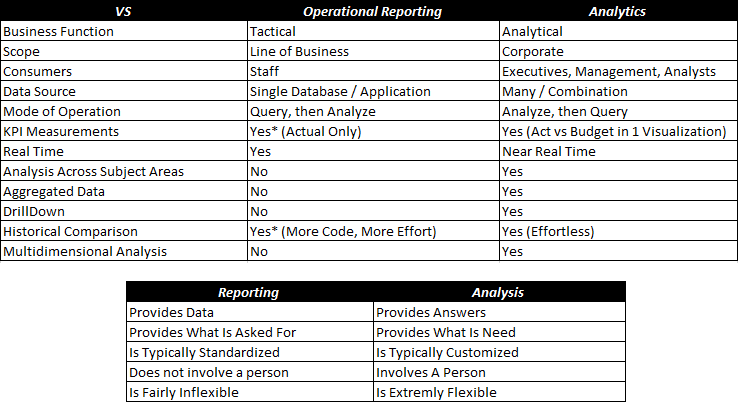 There are several differences between reporting and analytical solutions. Analytics: Analytical solutions will help you identify new products, customer segments, reduce cost, risk & fraud. It will help you convert information into knowledge. Example: Reporting solution will tell you number of stock outs by items by store whereas Analytical solution will tell you about optimum amount of quantity that you need to keep in your store to minimize stock outs and opportunity cost. Reporting: Reporting solution output will help you quantify past performance. Analytics: Analytical solution output will help you infer unknown facts and relationships. It will also help you quantify future probabilities. Example: Reporting solution will tell you about best selling products in your portfolio whereas analytical solution will tell you about probability of buying a particular product when your customer visits your store next time. Reporting: Historical standard reports, dashboards, KPIs, cubes for OLAP. Analytics: Predictive models, scores, forecasts. Reporting: Known, simple queries which can be easily optimized. Analytics: Queries that become very complex as they evolve via iteration. Why is it happening? What opportunities am I missing? Thomas Davenport has rightly said "Organizations that fail to invest in the proper analytic technologies will be unable to compete in a fact-based business environment." CEO commitment – To use analytics as a basis for competition requires commitment from the top of the organization. It requires an allocation of resources, long-term funding and, in some cases, a shift in culture. Strategic focus – Successful users of analytics don't just use analytics in general. They first define their distinctive capability and then use analytics to support that capability. Enterprise application – Firms that compete on analytics don't manage it locally. They eliminate fiefdoms of data, centralize the data and expertise, and manage analytics at the enterprise level.